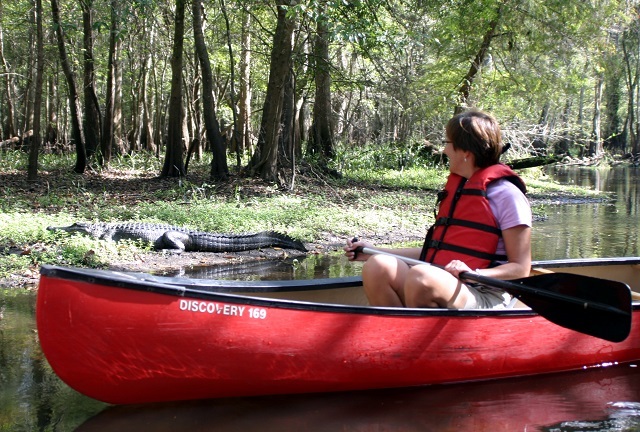 The Upper Hillsborough River is part of the state paddling trails system coordinated by the Florida Park Service’s Office of Greenways and Trails; this particular river is an easy paddle for most of its length, with great birding and wildlife watching. Start at either Hillsborough River State Park or John B. Sargeant Park and head downstream to either Lettuce Lake Park in Tampa or Trout Creek Park. The route from the state park to Lettuce Lake Park is 18.5 miles, and has one difficult section (Seventeen Runs) with many obstructions between Dead River Park and John B. Sargeant Park. The route from John B. Sargeant Park to Lettuce Lake Park is 11 miles (to Trout Creek Park it’s 7.3 miles). For those wanting an even shorter trip, paddle from John B. Sargeant Park to Morris Bridge Park (3.7 miles). Area canoe liveries offer guided tours and shuttle service also. This cool, clear river is lined with ancient cypress and emergent vegetation sheltering statuesque American Bitterns in cooler months; Wood Ducks are possible all year. Anhingas, Yellow-crowned Night Herons, Bald Eagles, Red-shouldered Hawks, Barred Owls, American Alligators, River Otters and Limpkins are also possible.